My biggest concern about bad weather when leading an outing is lightning. Everything else takes time to build, or is avoidable, but lightning is common, unpredicatable, and deadly. So, I keep a thought towards lightning when hiking, choosing a campsite, and scheduling activities. You should begin to prepare for outdoor adventures by completing the online BSA Weather Hazards training. It takes about 45 minutes to go through the ten sections and print your certificate. 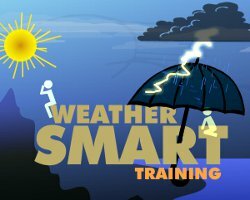 This training is a quick overview of potential weather dangers you may encounter on outings. Extending your knowledge about hazards in your area would be a good next step. The training starts with a set of questions which is a good way to review what you already know. This is followed by ten sections, each with pictures and narrated text about the weather hazard and then some review questions or activities to check your understanding. A complete tour plan requires someone currently certified in Weather Hazard training. Now, before your spring outings, is a great time to have everyone complete this training at MyScouting.org It might be a fun training topic at a troop meeting for all the scouts, or a crew meeting for the guys heading out on a High Adventure this summer. The Weather merit badge pamphlet is another good resource for learning more about reading weather signs and anticipating adverse weather conditions on your treks. I completed the Hazardous Weather Training, now how do I print the certificate for my council? Click "Menu" in upper left to display menu items. Click "Weather Hazards" and a window will pop up with your certificate PDF in it. Save the file and email it, or print it, or whatever you want.